Over the past few years, we have been working to piece together the record of major post-glacial volcanic eruptions in southern Chile that have occurred over the past 18,000 years. This work started off with a search for volcanic ash layers that were preserved in road cuttings, or cliff faces other accessible geological locations in the region. Since then it has expanded to include the search for pumice and ash layers (or, more generically, ‘tephra’) in peat bogs and lake core sediments. 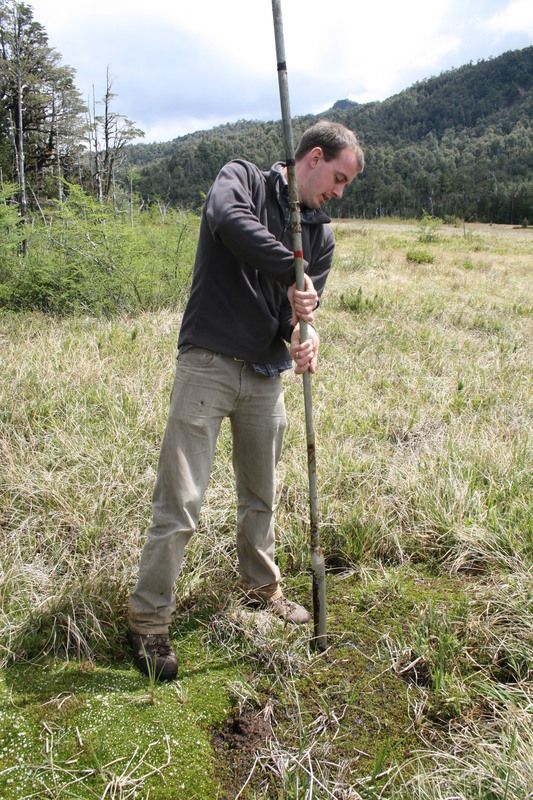 Seb Watt sampling a peat bog in southern Chile. By using the chemical compositions of the volcanic glass from each eruption to ‘fingerprint’ the deposits, we can now start to develop a framework in time and space of when volcanoes erupted, where they left deposits, and how large those eruptions were. Depositional environments for volcanic ash in southern Chile, from Fontijn et al. (2014). As well as looking at the deposits of past eruptions, which we can find in these cores and cuttings, recent eruptions in the region have also given us some new information on how the ash ends up where it does after an eruption. 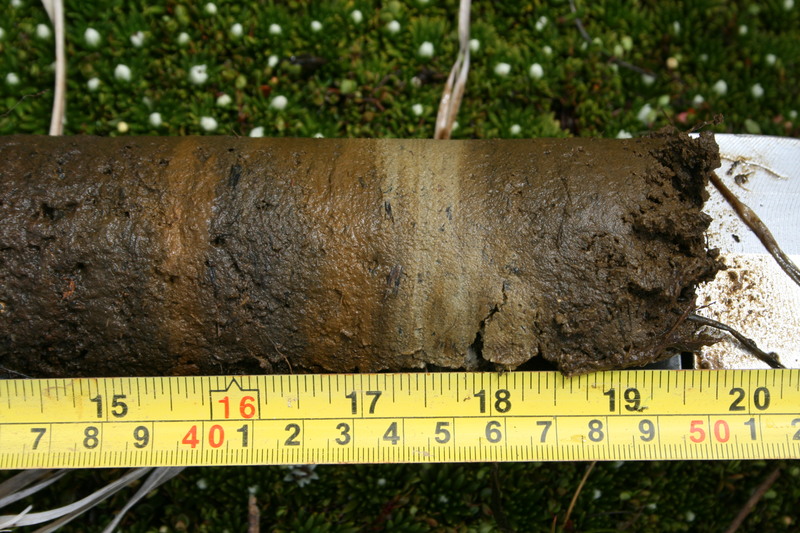 Pale coloured band of volcanic ash at 44-46 cm depth in a peat core sample, Cuesta Moraga, Chile. One of the fascinating stories that is starting to emerge from this work is just how patchy the preservation record can be – even for moderate to large explosive eruptions. In a really nice piece of work which has just been published, Sebastien Bertrand and collaborators looked at how volcanic ash and pumice ended up in the nearby lake Puyhue, after the 2011 eruptions of the volcano Puyehue – Cordon Caulle. 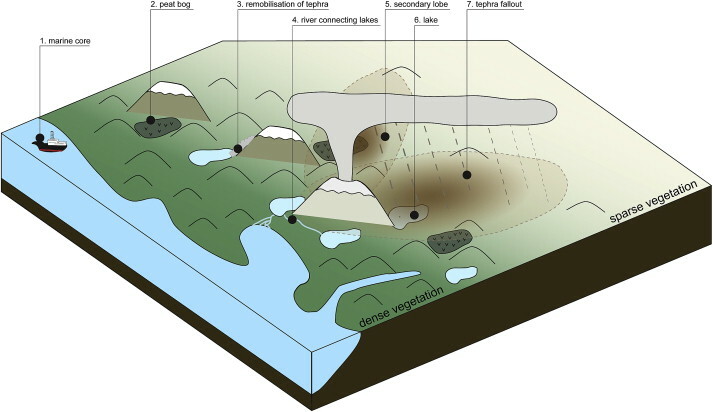 In this case, the dispersal of the ash clouds during the explosive phases of the eruption were very well constrained. As with most eruptions in this region, winds blew most of the ash clouds to the East, across Argentina, and there was no major phase of the eruption that deposited pumice and ash into lake Puyehue, to the West of the volcano. Instead, the thick deposits of ash and pumice that ended up in this lake – up to ten cm thick in places – must have been transported there by fluvial processes. Rainfall during and after the eruption would have helped to remobilise freshly fallen pumice and ash from the upper reaches of the watershed. 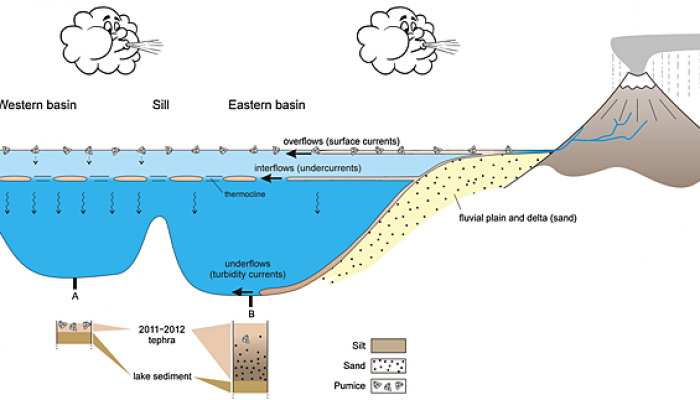 This tephra would then have been washed downstream, and into the lake, where lake currents at different water depths then helped to redistribute the tephra across the different parts of the lake system. This study provides a really nice example of the complexities of trying to piece together the deposits from ancient eruptions from the sparse environmental records that are eventually preserved. In the lake Puyehue example, the sediments accumulating at teh bottom of the lake will be an excellent archive for the deposits – since they will eventually be buried and preserved. But since the deposits are entirely reworked, their characteristics in terms of both grainsize and thickness could be quite misleading, unless they are recognised as ‘secondary deposits’. Since volcanologists usually rely on pieceing together the areas affected by tephra deposition from the few locations where the deposits are both preserved, and then accessible to later discovery, and then use these data to work out how big the eruption was and which way the winds were blowing at the time, this new work will make us all have to think a little bit harder about our interpretations in the future. S Bertrand, R Daga, R Bedert, K Fontijn, 2014, Deposition of the 2011-2012 Cordon Caulle tephra (Chile, 40 S) in lake sediments: implications for tephrochronology and volcanology, Journal of Geophysical Research (Earth Surface), in press.